An interesting photo, notice how the WOI seated at far right wears both a Sam Browne belt and a superior cloth (officers' quality) version of the Service Dress jacket and trousers. 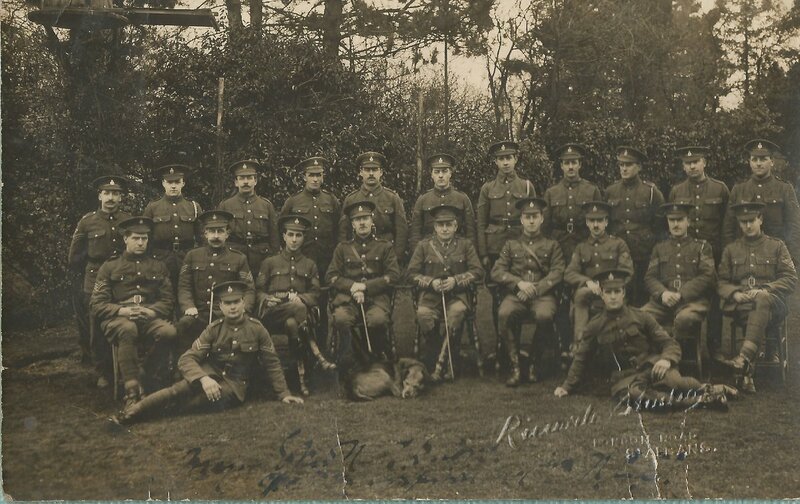 The WO1 to the left in the same row (also with Sam Browne) has instead a tailored version (collar) of the standard OR's SD jacket and trousers. 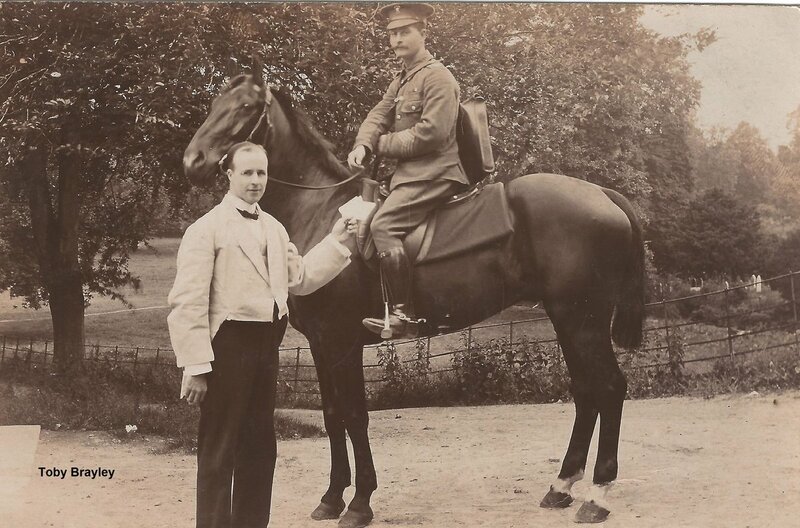 Army Veterinary Corps. St Albans photographer. The Major is named front and back; I still can't read it though! Any suggestions welcomed. My dear old Mum is visiting and brought with her a cache of old family photos including a number of unidentified military personnel. 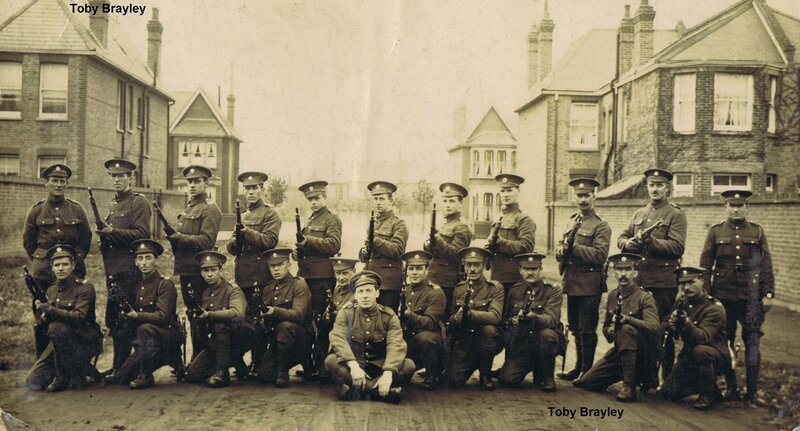 I'm hoping I can narrow down the options if the kind members of this forum can help identify the regiments. Here's the first one...more to follow in subsequent posts. 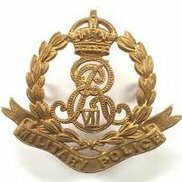 Might the cap badge be Royal Engineers? 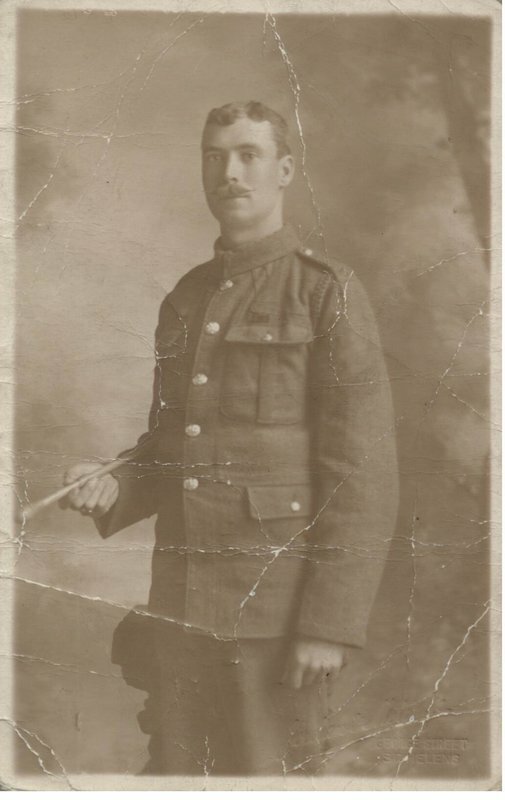 My family all comes from St.Helens and there was a Territorial Field Company formed at the Cropper's Hill Drill Hall in which a couple of relatives served. Yes, I think this first photo shows the badge of the RE. The rank is Second Corporal (one stripe), which in the RE was a substantive rank (for pay and pension) and not merely an appointment (probationary position). 12th Lancer with "urgent" dispatch! Appears to be in Simplified S.D. 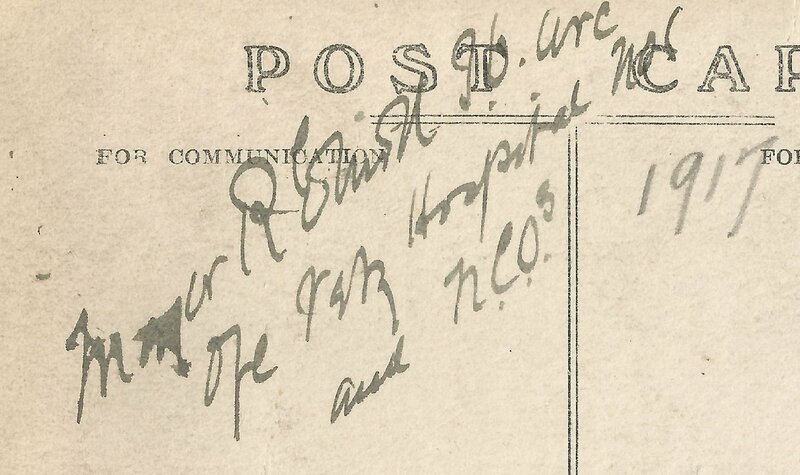 1915 Postmark on rear. 18 years service and a Boer War Veteran. ASC Men form a Road block. 1915 dated on rear. 1888 Bayonets. Thoughts on the Rifles? They are rigby nosed capped (hence the 1888) but look a little too short for CLLEs, they are also missing the foresight protector found on most CLLES. At first I thought Martini Enfields but a but a bolt is visible, a trick of the camera perhaps? Thanks Frogsmile. 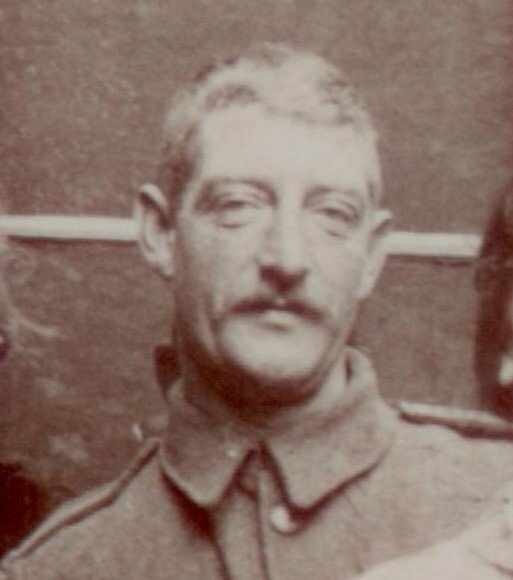 Based on the shape of the ears, the slightly dimpled chin and the general appearance, I think he may be this man, a cousin by marriage, who lived in the house opposite my Grandparents (and Great-Grandparents). 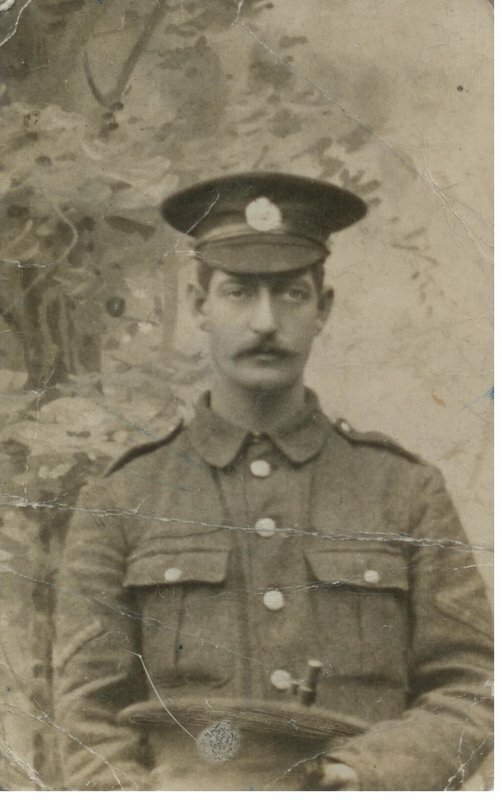 He survived the war as a Cpl in the 1st West Lancs Field Coy. Here's the second of my "unknowns" from the family photo collection. 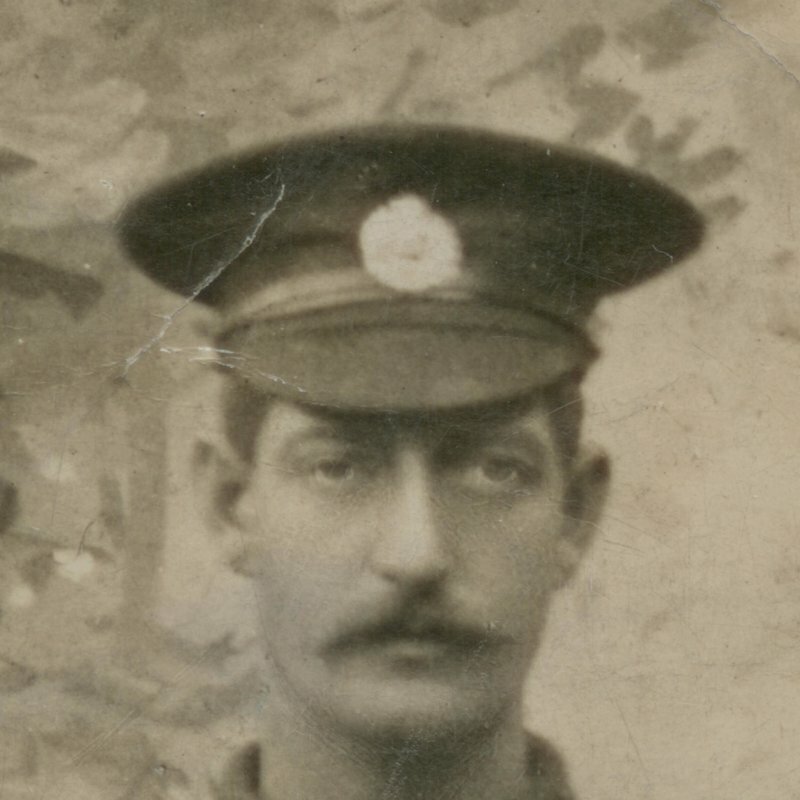 I'm pretty sure it's another RE from 1st West Lancs Field Coy...but he has a rather splendid 'tache! The eyes are very distinctive too and I’m sure it’s the same man. This man is a warrant officer of the RE. Before 1915 a unit’s Sergeant Major (RSM) wore such a badge, after that date it was company Sergeant Major (CSM) and the RSM wore a coat of arms badge. This man is a warrant officer of the RE. Before 1915 a unit’s Sergeant Major (RSM) wore such a badge, after that date it was s company Sergeant Major (CSM) and the RSM wore a coat of arms badge. Thanks Frogsmile. I suspected he was some flavour of RSM/CSM. That should make him easier to name, particularly if he did serve in 1st West Lancs Field Coy. I'll do some more digging elsewhere and see if anything emerges. I wondered if it might be the Queen's South Africa Medal but the central stripe was darker than the ones on either side. I suppose that effect could be caused by filters applied to the lens when the picture was taken....maybe? 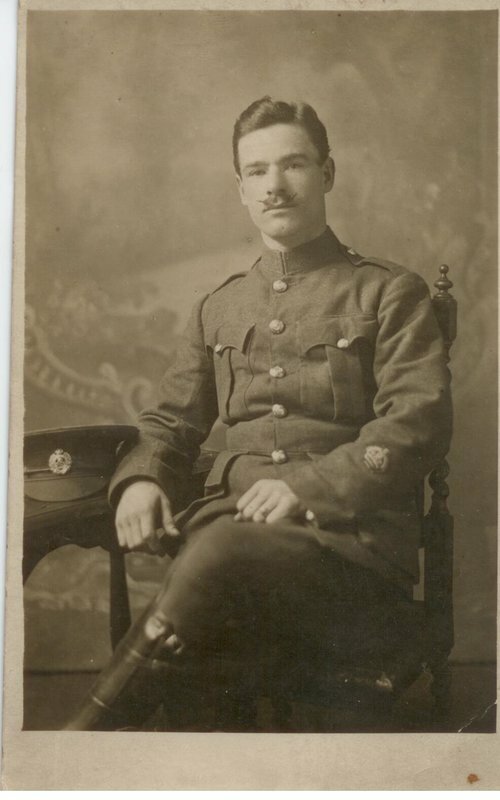 As regards the Sergeant Major in the earlier photo, I didn’t notice at first that he has the superior cloth and cut (officer pattern) service dress, which confirms him as the higher level, unit Sergeant Major (Warrant Officer), that after 1915 was designated as a 1st class WO. Not a filter, but the film used - orthochromatic film. This renders some dark colours light and some light colours dark. In this case it picks up the blue-black of the narrow stripes and makes them lighter, and turns the red central stripe dark. Thanks Frogsmile. 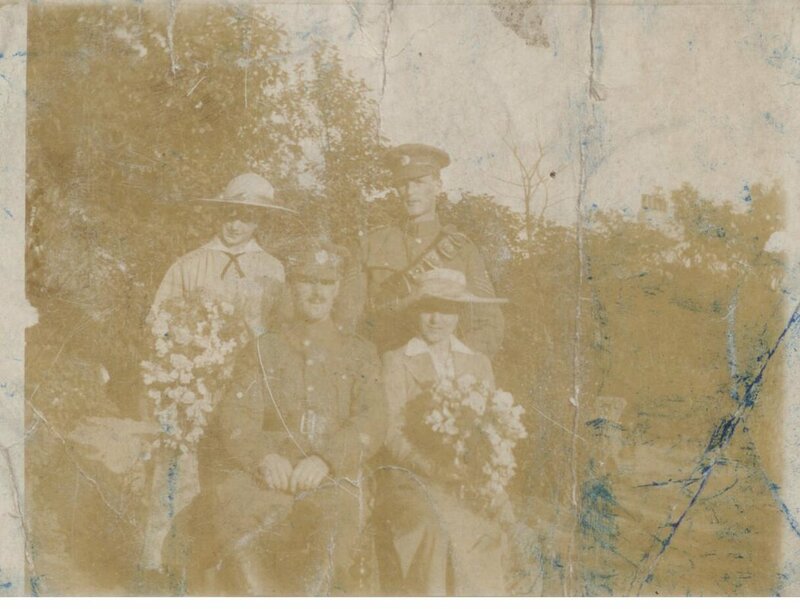 I'm still ploughing through all the photos and came across this one which appears to show the same man together with a RE Staff Sgt and a couple of girls - presumably one is the wife of the Sergeant Major. Apols for the poor quality - the original is in very tatty condition. I still haven't found time to research in more detail who they might be. Thanks Andrew. I'd forgotten the who orthochromatic tonal switcheroos that can happen, particularly with yellows and reds. I think that they are both RE. There were many specialist appointments for RE that held Warrant Officer rank. Notice his leather gaiters rather than puttees. The sapper seems to be on mounted duty from the bandolier, perhaps from a pontoon section, or signals service. Interesting, Frogsmile. Another respondent on a different forum suggest he might be from the local TF Sigs Coy. The snag is that I know of no family connection to that unit and the possible identity proposed, CSM Johnson, lived on the other side of town from my family...so the mystery continues. Of course the possibility remains that he was in the local TF Field Coy. After deploying to France in Jan 1915, the unit was engaged in building pontoons. One of my more distant relatives was wounded while performing such a task in June of that year. I would suggest the name of the Major in post #5578 is "R. Elliott"
Perhaps the photo is a souvenir of that occasion. Googling "horse hospital st. albans" finds this https://books.google.co.uk/books?id=IRfdDAAAQBAJ&pg=PT116&lpg=PT116&dq=horse+hospital+st.+Albans&source=bl&ots=OUCAn3LQG2&sig=Eca7h7Lk7B4TdSwLQf9mL5yUimE&hl=en&sa=X&ved=0ahUKEwi39obryJTbAhXKDcAKHaW3BO0Q6AEIhAEwCQ#v=onepage&q=horse hospital st. Albans&f=false in which there is reference to a Major Elliott, although it does say he was invalided out in 1915. 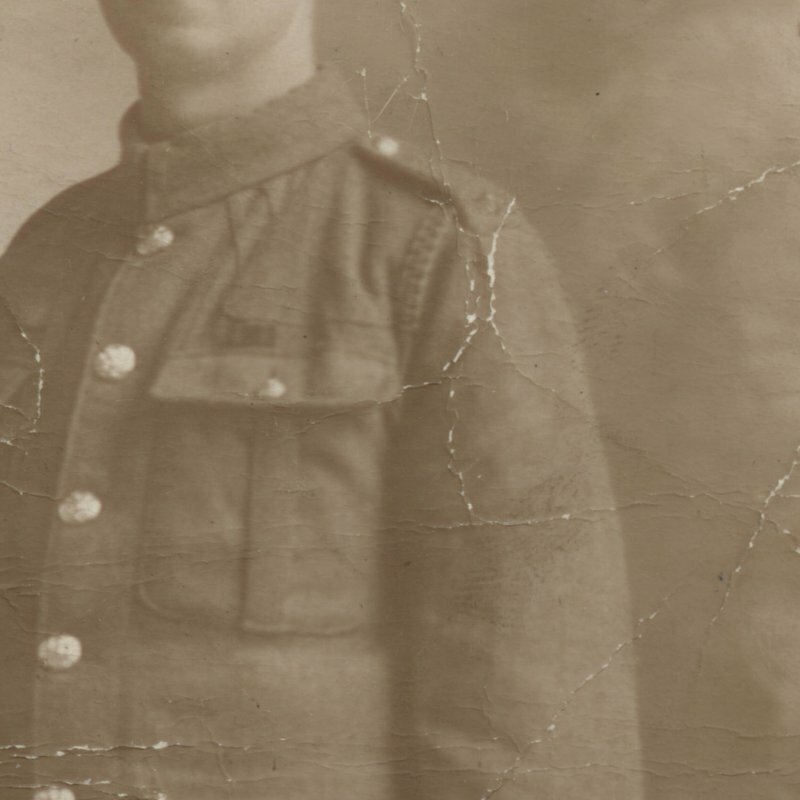 Robert Elliott was born in Middleton St. George, Durham in about 1874 and appears to have belonged to a family of vets. As with the others, I have no clue who this might be. I can't match her face to any of our female relatives...so efforts to identify her, or any of my "unidentified", will be a real long-shot. Irrespective, it's a nice photo (IMHO). 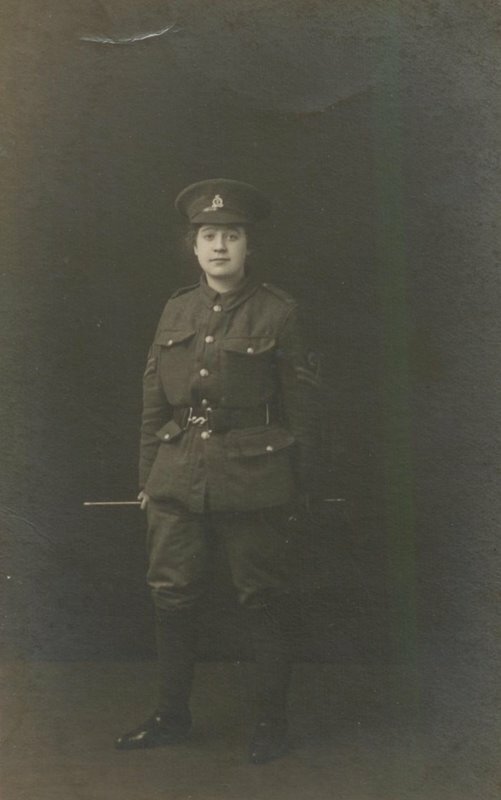 She is dressed in the uniform of a RAMC Corporal, note the Geneva cross above the stripes. Women dressing in men’s uniform became popular after some female music hall artistes did so with popular acclaim, but it had also been the practice of Royalty pre-war, especially in Europe, leading to publicity in many national newspapers. Hi Frogsmile, are you suggesting it could be Father, Husband or Brother's uniform? Great photograph though. Perhaps her name is "Bob"? Sorry...couldn't resist! I'll retreat to my hovel, coat in hand!